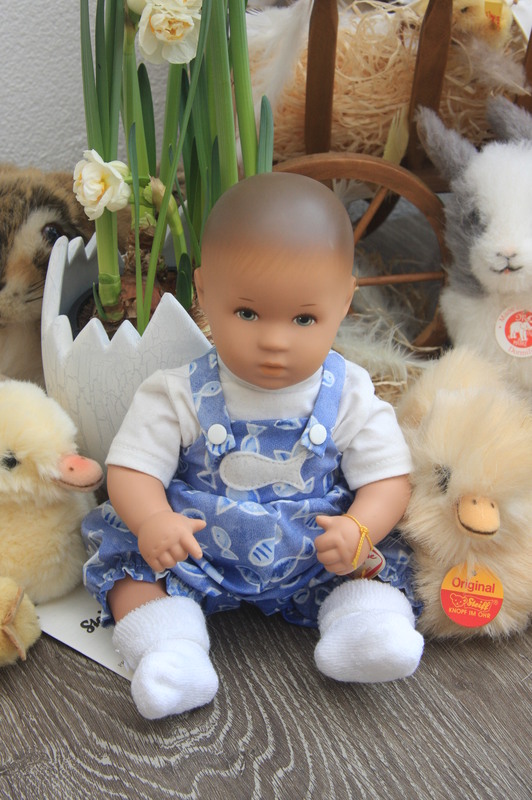 A large collection dress sets for all kinds of dolls. 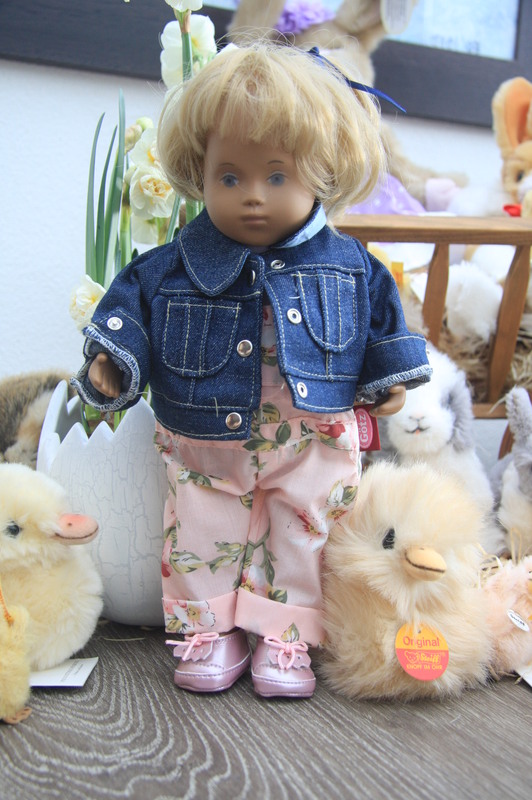 Lots of different dress sets to redress your doll. Many of them are suitable for Sasha or Sylvia Natterer. The dolls in the pictures are not for sale. Riding is a wonderful sport. Groom and feed your pony, care for it and style its mane. With this large pony, all of this is possible. Hairbrush is included. With a height of approx. 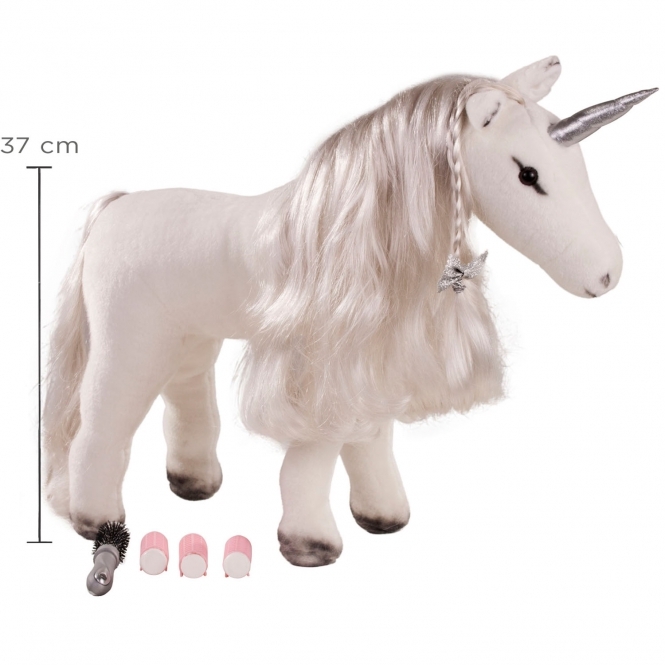 37 cm, this is Götz's largest pony. For standing dolls up to 50 cm. Not suitable for children under 3 years. Choking hazard due to small, swallowable parts. 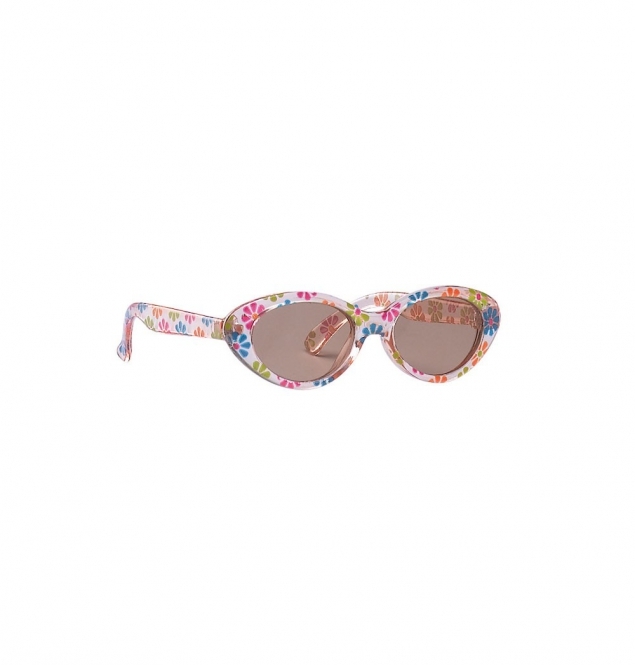 Super stylish sunglasses with a flowery design and a case for your doll. Not suitable for children under 3 years old. Choking hazard due to small swallowable parts. An absolutely fashionable winter set. The jacket has sweet bows stitched onto it. The double row of buttons and the plush hood keep the wind out. The shimmering winter jacket and the glittery boots look simply great. Doll and jeans and accessories are not included in this set. 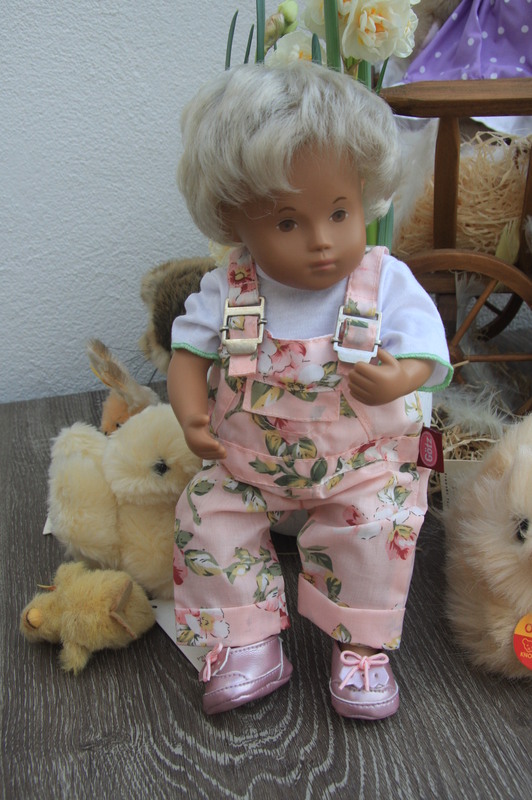 Also fits Sylvia Natterer dolls, only the boots are quite big. Dress set Rose Garden 30-33 cm. Spring is here. Does your doll need something new to wear? Then this set is just the thing. 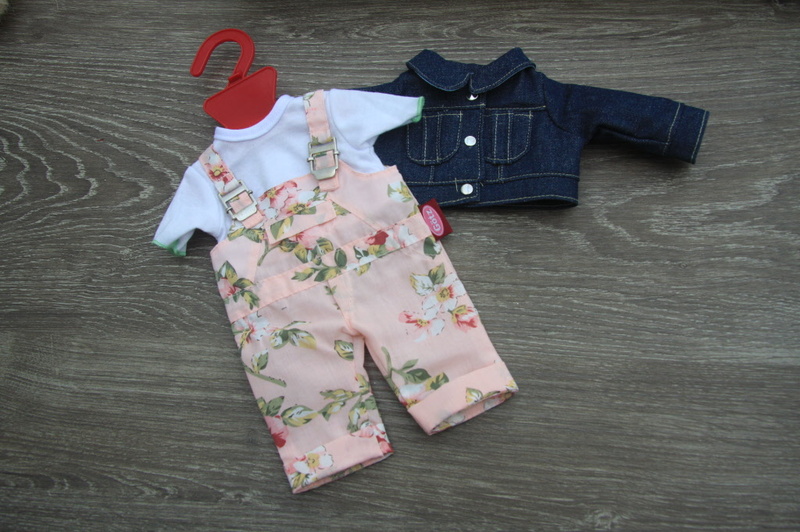 A smart pair of dungarees with a rose pattern and shirt. Suitable for any occasion. Simply comfortable and above all stylish. Should it get colder, just put on the casual denim jacket. Simply great! 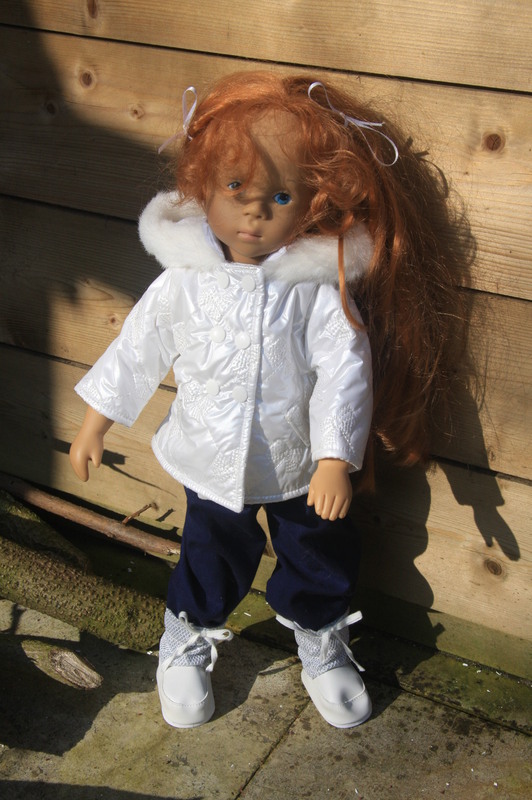 A white jeans for slim 25cm dolls. Socks in pink and white for 33 - 45 cm dolls. 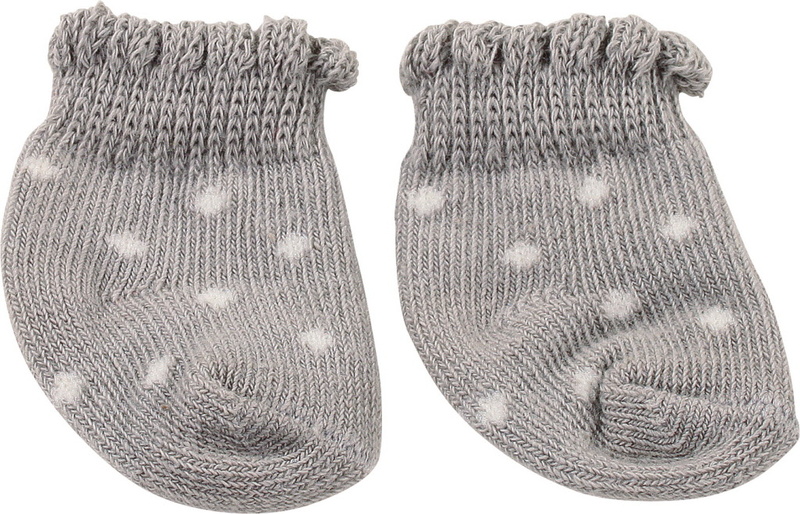 With these cuddly socks your doll not only looks lovely, but she'll always have warm feet. Not suitable for children under 3 years old. Choking hazard due to small, swallowable parts. Blue and pink socks for 33 - 45 cm dolls. Götz dress set summer for 45 - 50cm dolls. Pink dress with bag and shoes for Hanna and Happy kidz dolls. 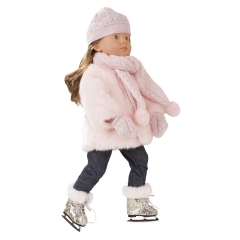 An absolute must for every doll who likes to go ice skating. She’ll really make a great impression with this. She skilfully performs pirouettes and goes back and forth while having a huge amount of fun. The glittery lace skirt over the bodysuit gives the whole thing a distinct look. Doll not included in set! Stockings are IN and your doll can wear these for any occasion. The special tops and the cute dots are simply stylish and chic. Besides that, your doll will always have lovely warm feet. 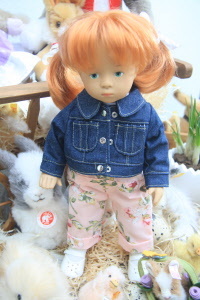 Götz Dress set jeans for 30-33cm dolls. 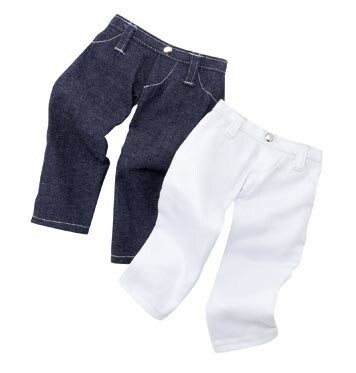 A super fashionable basic jeans set. The dark jeans have pockets in the legs and a fabric tie belt. The second pair of jeans are in a pink/white stripy pattern and also have a fashionable tie belt. 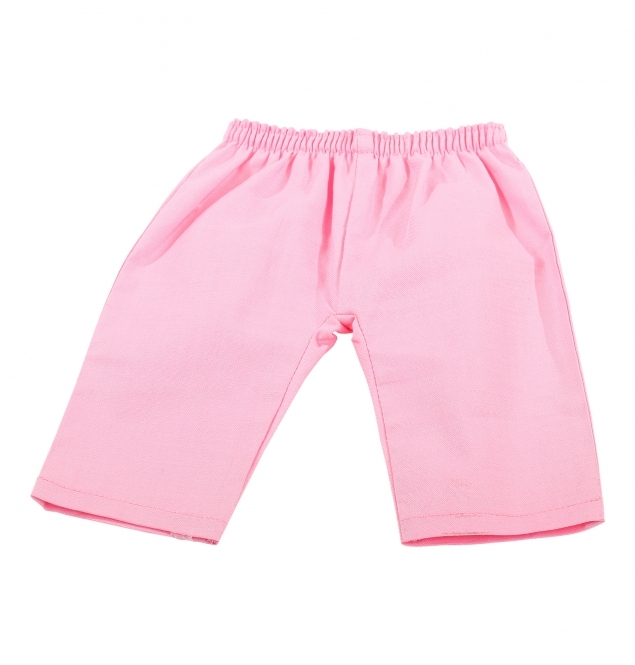 Götz dress set basic pink trousers. 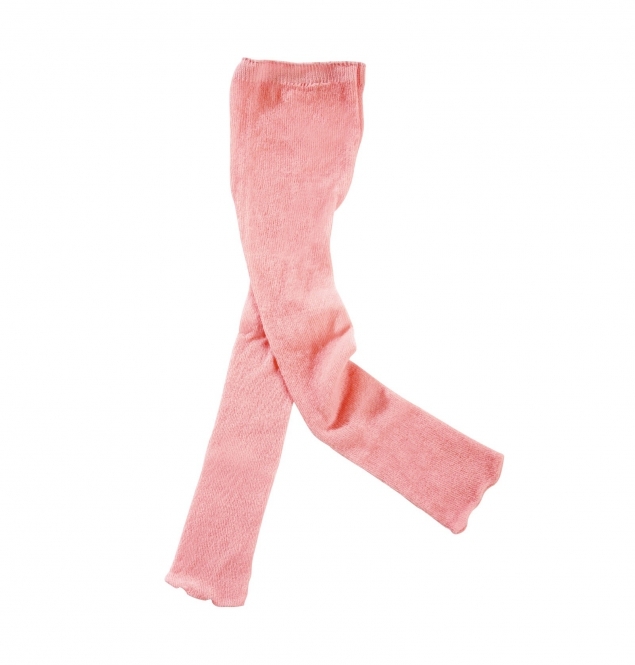 Nice pink trousers from the Götz basic collection. 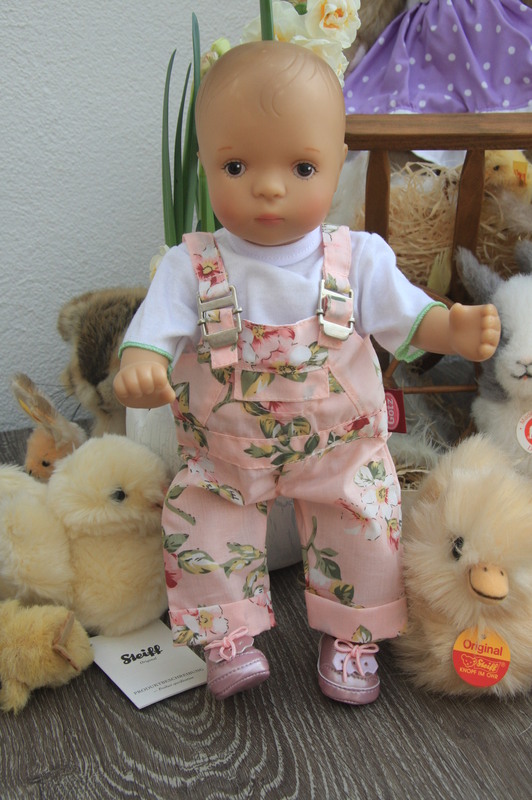 It fits the Götz Sylvia Natterer baby dolls as well. A great basic pair of trousers that go with anything. Wear a casual shirt with them, or, if it’s a little cold out, a nice sweater. Your doll is sure to be well dressed. With an elasticated waistband, the trousers are easy to put on and comfortable to wear. This item is part of the Basic-Boutique range and comes without any outer packaging. 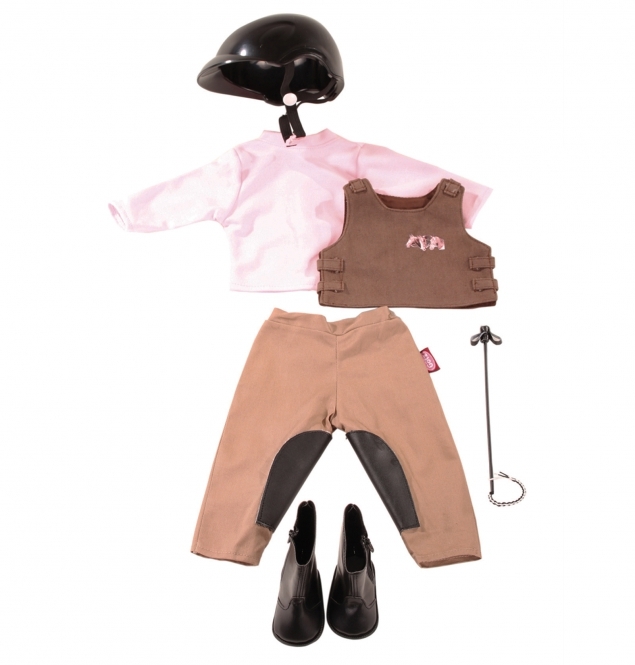 A stylish riding outfit for a short horseback ride. Also comes with matching riding crop, riding helmet and boots. Everything is colour-coordinated. Just saddle up the horse and your outing to the forest or the meadow can begin. 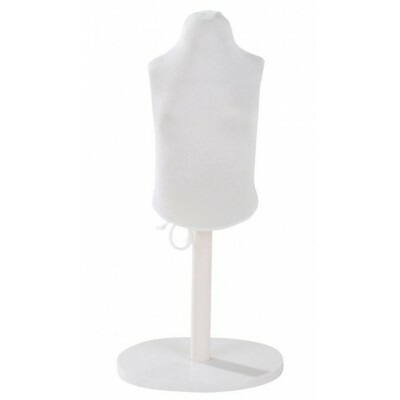 Götz baby grow flower, for 30 -33 cm dolls. A really sweet babygrow for your baby doll. With its sweet flowery pattern and lovely ruffles at the neck, it looks simply beautiful and is super comfy. Nothing stands in the way of going out for a walk in this. Götz dress set Tshirt London Bus, for 30 - 33 cm dolls. A great shirt with a hooped pattern that little dolls will love. It goes great with jeans, or worn casually with a skirt and boots. The soft jersey is very comfortable to wear. This item is part of our Basic-Boutique range and comes without any outer packaging. 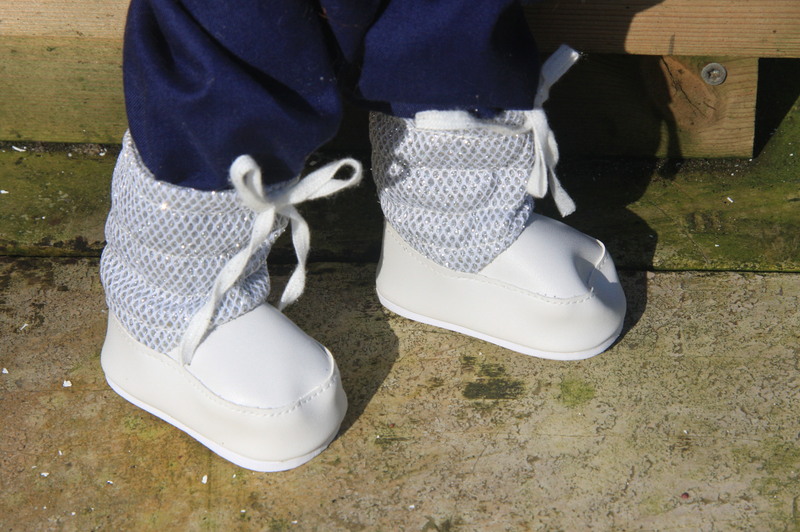 A stylish number that goes with almost anything and keeps your doll warm. 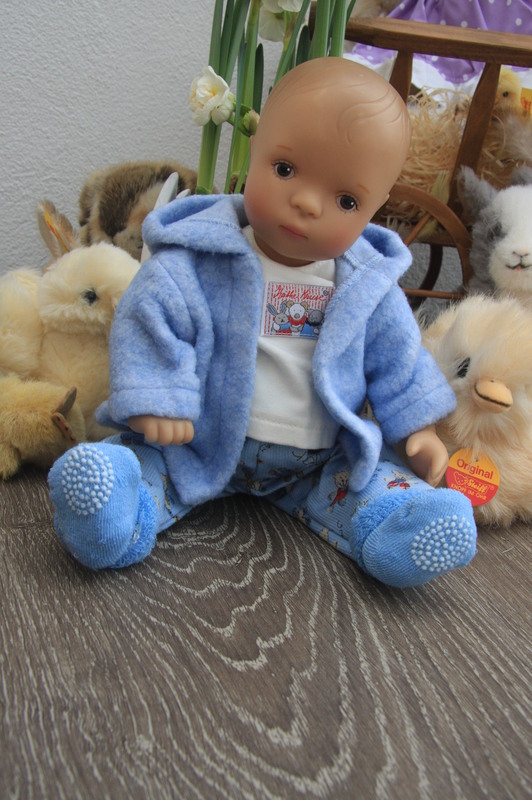 This cosy cardigan with cute lapels is a fashion item that should be in every doll’s wardrobe. 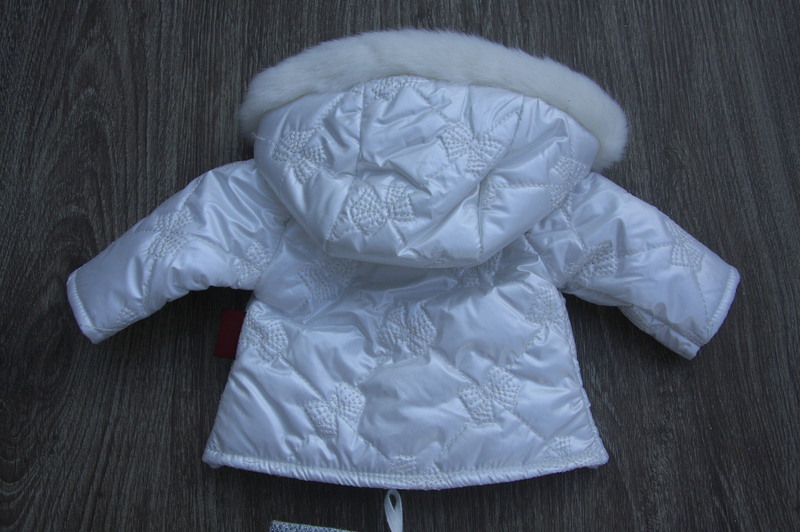 This jacket is part of the Basic-Boutique range and comes without any outer packaging. An elegant set for cool seasons that goes great with jeans or a stylish skirt. 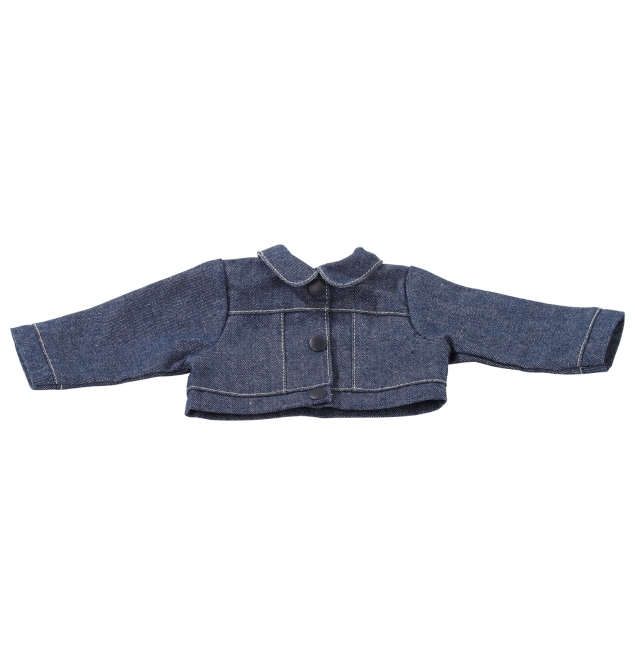 Your doll is certain to like this cosy cardigan with a delightful Norwegian design. A jolly outfit with delightful patterns. This wrap-around jacket is adorned with a leopard pattern, and the comfy little trousers come in a chequered pattern. This will make your outing fun, as your doll wants to be stylish after all. You can never have enough jeans. With this set your doll has two options to choose from. Your doll is always well-equipped whether she's going shopping or would like to go to the playground with you. Götz outfit shirt met teddy, for 30 - 33 cm dolls. Dress your baby with this lovely shirt and off you go to the fun fair in town! The glitter Teddy with it´s balloon will be just as sparkling as the fun fair itself. 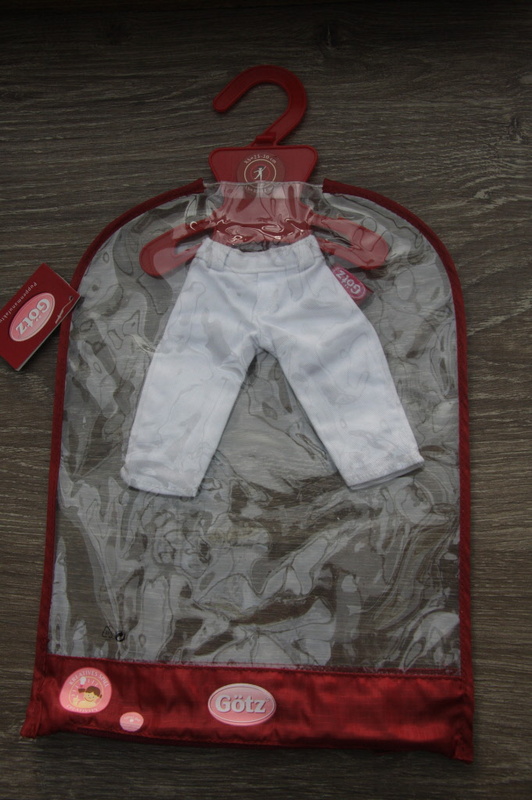 White trousers for slim 25 -27 cm dolls. The perfect set for a warm summer day! Just blow up the pool and fill in some water and the bathing fun can begin. 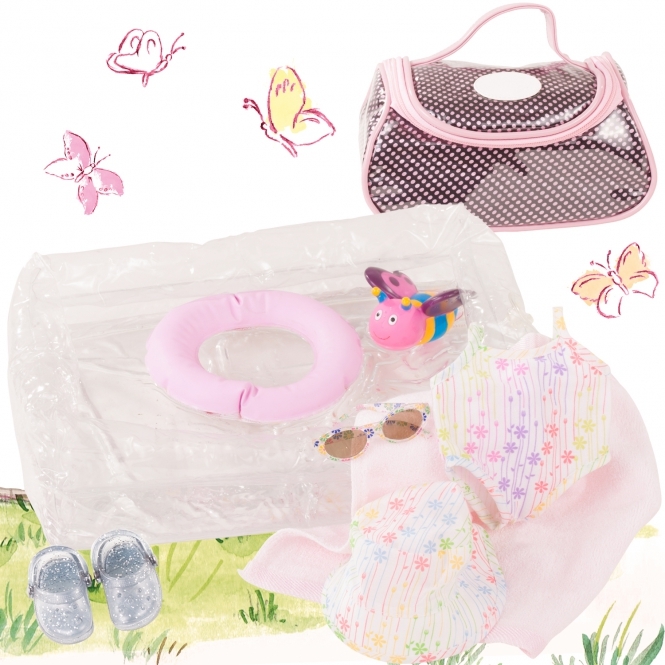 Put on the cute bathing suit, slip into the Dollocs and go out on the meadow where you can go into the pool. After the water fun it's time to dry off. Your doll needs her hat and nice sunglasses as protection from the sun. As bathing makes you hungry take out some food and drinks from your nice bag and enjoy. This bag is just fantastic! It provides good storage place and also looks very beautiful! The doll's mum can use it later on for pen and paper, her favourite book or maybe as wash bag when having an overnight stay. Not suitable for children under 3 years. Choking hazard due to small pieces which may be swallowed. Shiny boots in patent-leather style don't only look good when it is raining. Combined with a pair of jeans or a skirt your doll will be up to date. Just take some sunglasses or a cool jacket and you are all set. Today your doll has a fine apperance in proper style. A plaid dress with laced sleeves and lordly plush collar combined with boots and glitter bag - your doll will feel great in this outfit! Götz Maillot XL Pink: 45 - 50cm. Not only for cold days.These tights look really fashionable under a dress. Götz sunglasses aviation. Fitting most dolls 33-50cm. 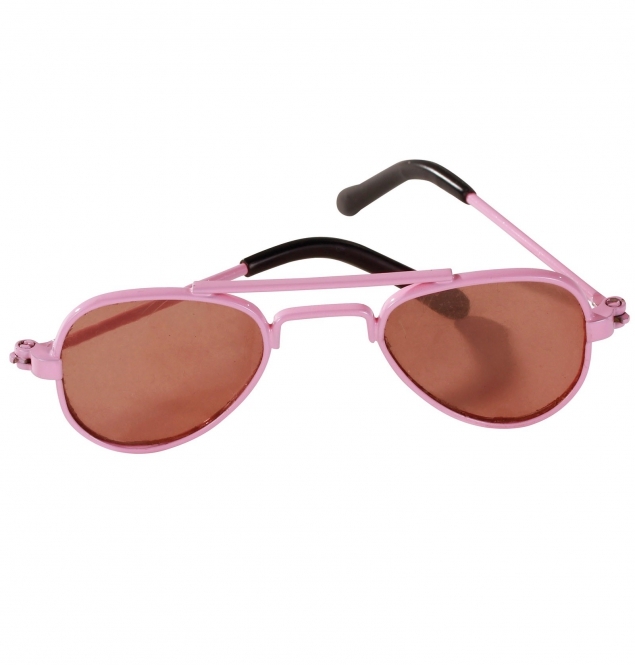 Super-chic aviator style metal sunglasses With a case for your doll. An important accessories for your doll. 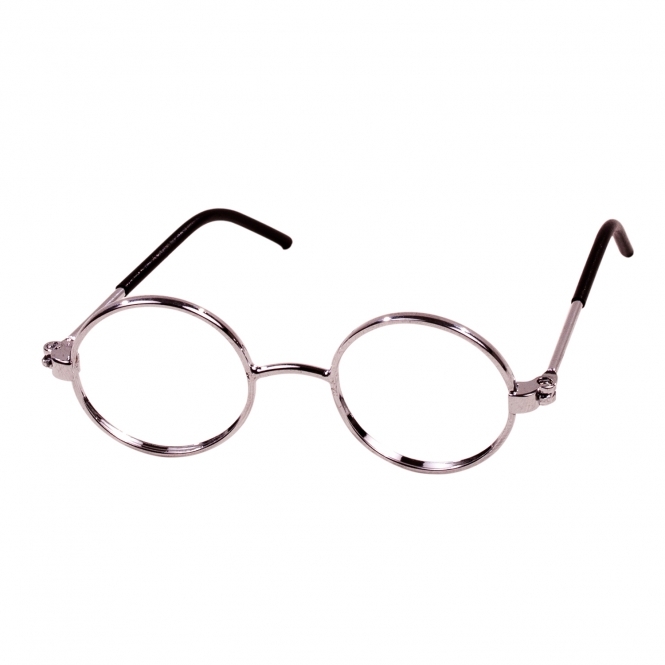 Metal-rimmed glasses without real glassware - just stylish and cool. 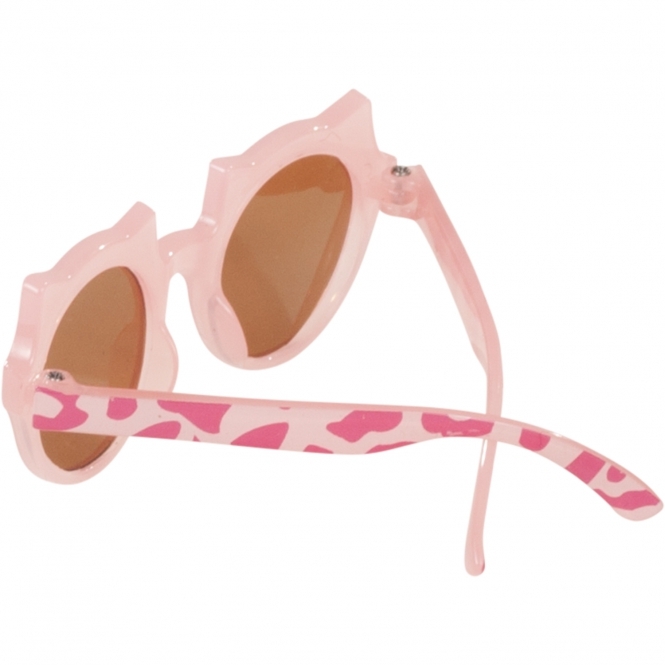 Götz Sunglasses Tiger: 42 - 50cm. A stylish must-have for your cool doll. Sunglasses in 50ies look which pep up every outfit. 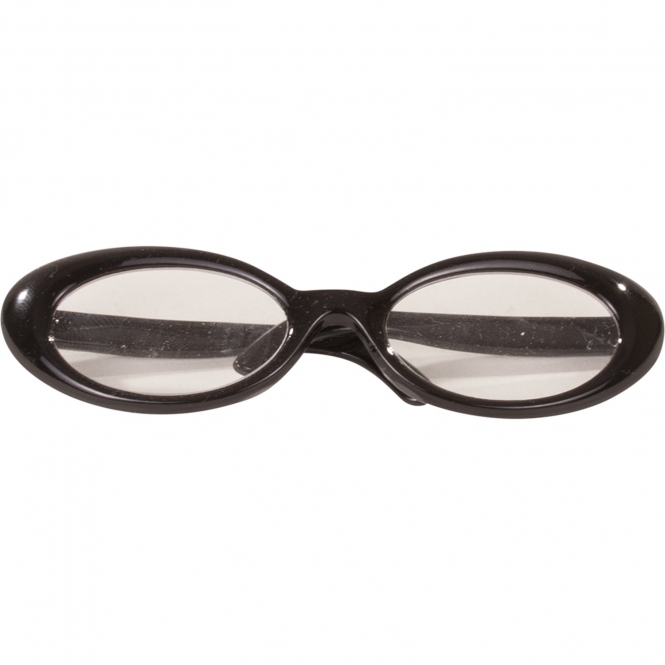 Götz glasses chique, 33 - 50 cm. What a stylish accessory for your cool doll. Glasses in 50ies look which make any outfit special. With this set your doll has 2 very nice underpants with one undershirt. The embroidered days of the week on the pants look very chic. Have a nice weekend! 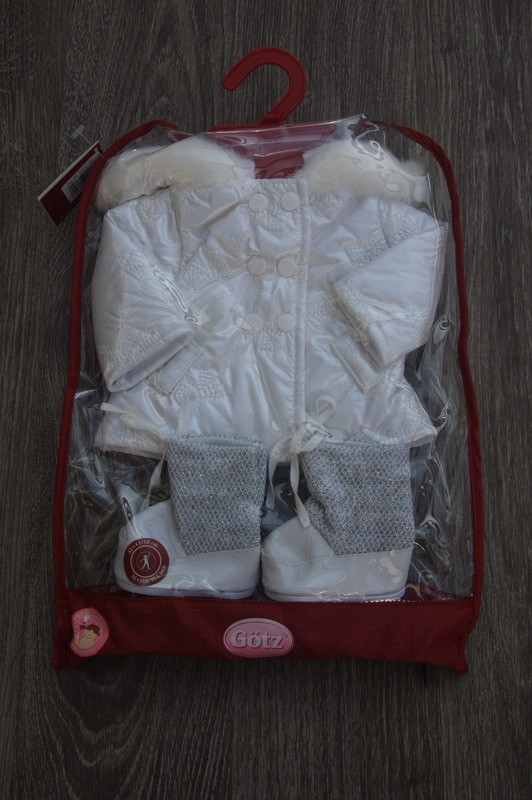 Götz winterset furry: 45 - 50 cm. Hooray, finally it's cold enough to put on this great winter outfit! 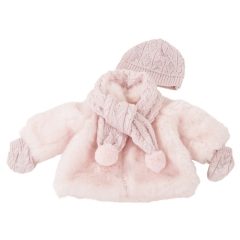 This warm plush jacket in rose is very noble. Just add the knitted hat, scarf and mittens with nice plait pattern to complete your style. The mittens are attached to a thin cord so that they don't get lost. Combined with some jeans the look is more casual and worn with a skirt this combination looks very noble. Your doll will be the prettiest of course! Götz set Rosalie, 45 -50 cm. For the XL dolls 45-50cm. 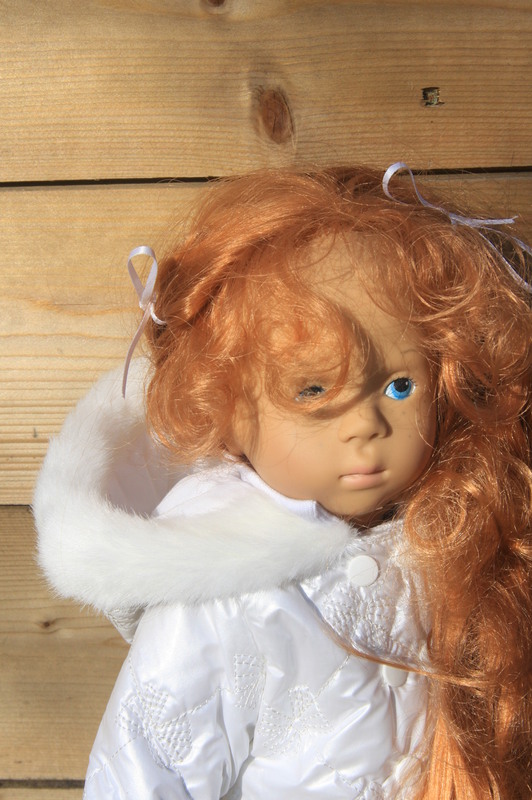 Do you have a party coming up and your doll doesn’t have a really great outfit? With this outfit she’ll be wonderfully dressed. A fine set with a handbag and matching flats. All in silver/pink – perfect! 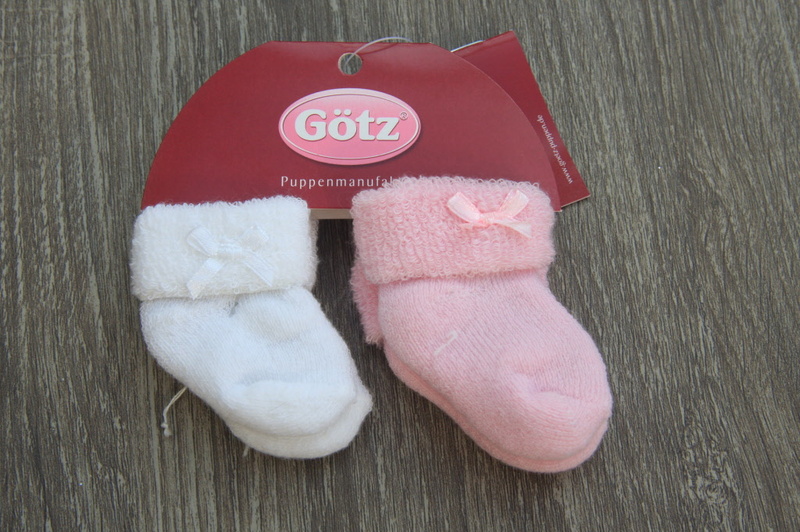 Götz set Ballet Fun, 45 -50 cm. This set has been used as decoration for Hannah in our shop. With this set your doll has everything she needs for practising ballet. Put on her leotard and tulle skirt on top. Don't forget her wrapover cardigan, leg warmers and ballet shoes. Good luck and have fun training! Götz set Ladies: 45-50 cm. For the XL dolls 45-50 cm. What a nice summer dress! Comfy and noble in 50ies style. A light fabric with large bow around the belly. 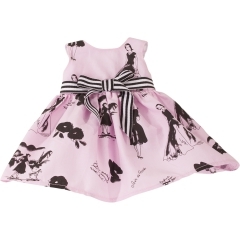 Your doll will love this dress and only wait for the next occassion to wear it. For the S dolls 30-33 cm and the XL dolls 45-50cm. Your Gotz doll will have really cute underpants with embroidered pictures and days of the week. Just perfectly equipped! For the M dolls, 42-46cm and the XL dolls, 45-50cm. Your Gotz doll loves smart dresses, skirts or shorts? Then these opaque beige tights are perfect as they keep her warm and look very chic. Her neutral colour goes with every combination. 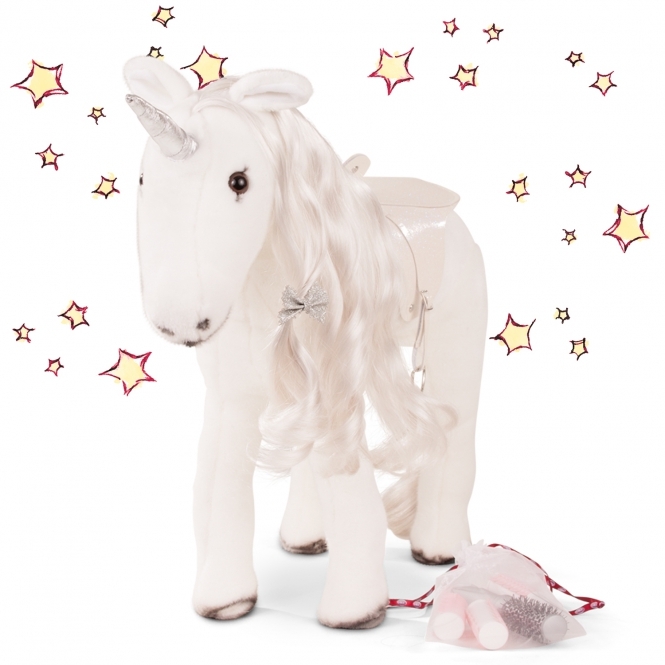 You will have magical moments with your unicorn. Just comb and style it - the brush and curlers are included. Götz Saddle and Tack Silver Star for Unicorn. 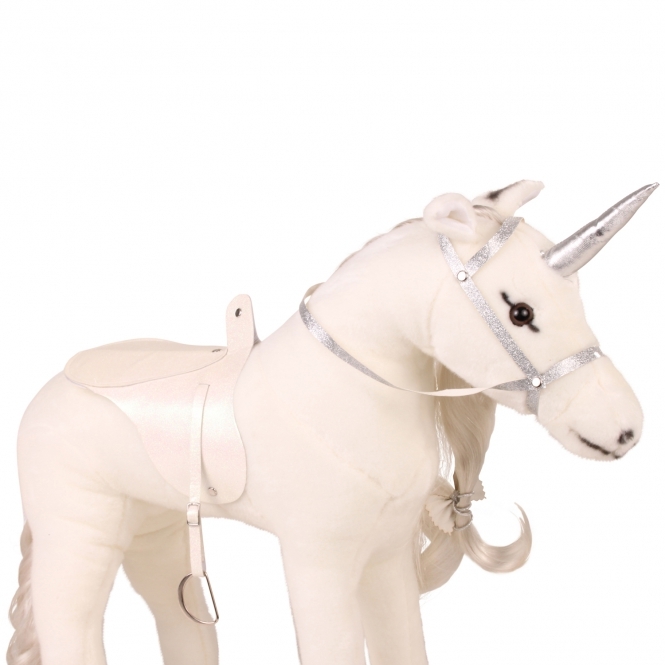 For her ride on a real unicorn your doll needs a glittery saddle and harness. 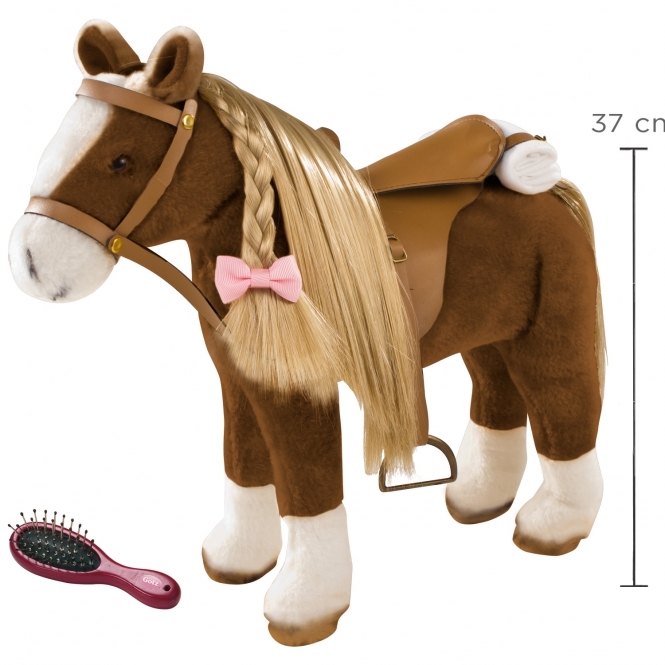 Of course you can put this also on your brushing horse if you want to give some magic to your brown plush darling. Decorate or use it to make your own dresses. Meant for the 50cm doll clothing. Your doll loves cats and can perfectly show this to everyone when wearing this outfit! The t-shirt has little cat ears on the chest and also a cute ribbon. The jeans and hair circlet look cool with it but the absolute eyecatcher are the elasticised glitter ballerina shoes. This combo is just a dream for your doll! There is shimmer and glitter allover and also a cheeky unicorn. This shirt will be loved by little princesses.